Robots: the “ables” of the next technology trend – LET'S TALK ROBOTS! The report is out – there should be rejoicing up and down robot street! Why? Because one of the tech industry’s most respected analysts is being very bullish about robots as the next technology trend. These are the figures that you wave around on SandHill Rd. This is what VCs and angel investors read. But if you don’t hear anyone cheering yet, it’s because no one is calling it a robot – it’s an “able”. It’s a “wearable, drivable, flyable, scannable” device. A connected device. Lesson for all robot startups. Don’t call it a robot, call it a connected device. 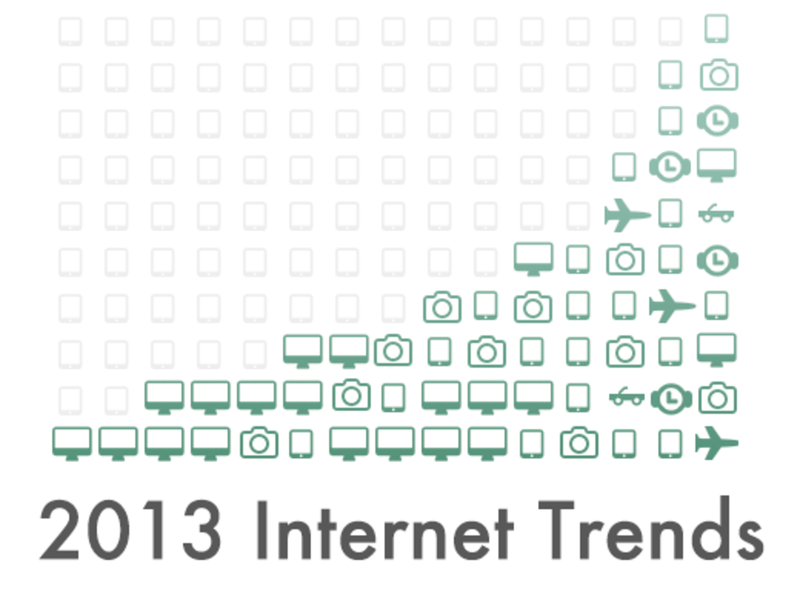 Mary Meeker’s highly anticipated annual report “2013 Internet Trends” was released on May 29. She is also looking at robotics, only she is calling them connected devices or ‘ables’. I would go so far as to add one more ‘able’ to her list; the ‘senseable’. Devices like the Kinect, the Leap and a whole range of new optical and chemical sensors will be adding a lot of value to the ecosystem. They’re made by roboticists, used by robots, and any other connected device in our Internet of Things. This is a very broad report covering global growth in the internet and mobile industry, the repurposing or reimagining of our relationships with existing technology, the rise of new computing platforms, right down to global economic growth and immigration patterns. The most interesting section for robotics is Meeker’s naming of the next technology trend. Meeker says that approx every 10 years there is a cycle in the technology platforms. Scannables is a great figure for robotics, especially if you add my new senseables category, the proliferation of connected sensors from health devices to oceanographic and environmental monitoring. Meeker’s statistics show fourfold growth in the use of codes in China in the last year, delivering 9 million uses per month at a conservative estimate. This contributes significantly to the process of digitizing the world, driven by offline retailers and user generated content. If you add senseables in as well, the speed at which the crowd sourced conversion of the world to digital information readable by robots is well underway. While there is currently controversy of the accuracy of one widely quoted statistic in Meeker’s report, the general data is solid. Meeker’s claim that “the average smartphone user checks the phone 150 times a day” was taken either from inaccurate or out of context sources, including the mobile industry analyst Tomi Ahonen. Ahonen’s much used statistic was collected informally and applied to non-smart phone users. Analysts are now quick to point out the impossibility of generalizing a useful figure out of an incredibly wide range of phone users. But for robotics, the simple figures are good. There are 2.5bn internet users today. There are also 5bn phone users with an increasing proportion also becoming internet connected. The smart connected device space is growing. Our world is moving towards ‘ables’; wearables, drivables, flyables, scannables and senseables.